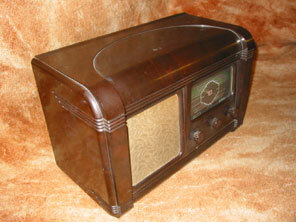 Here we see another bakelite receiver from GEC, this time it's the AC38. Released in 1938 it was also known as the BC3840. This time a horizontal cabinet has been used which is really rather attractive, it has quite a lot of fluting on the sides, which extends round the front as ridges and add much interest. The top of the cabinet also has a wide semi-circular arc formed in the bakelite. No chrome to be seen anywhere on the receiver now, and the speaker cloth is left completely unprotected. That said the cloth does feature a rather nice pattern woven into the silk. 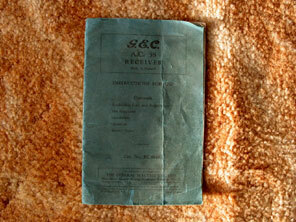 Shown above is the instruction book for the receiver. The instruction books tend to be much less common than the radios themselves, and the original owner of this receiver must have been confident of problem free service as the guarantee card has never been completed and returned to GEC! The image right shows a clip from the page demonstrating the controls and indicators. This receiver was suitable for medium wave and long wave only, and like the AC37 seen on the previous page the wave change switch had a position where a Droitwich Filter could be brought into circuit. 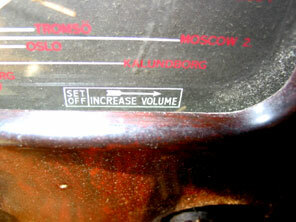 This was also the first year where GEC employed a system whereby the position of the on/off-volume control and the wavechange control would be indicated in the tuning scale glass. This was achieved by the use of steel cables linked to the aforementioned controls that pulled a small pointer across the bottom of the tuning glass. The glass itself was printed with the switch position/progress, so the operator could see (for instance) which waveband the receiver was switched too at a glance. The picture left shows a close up of the receiver where this feature may hopefully be seen, in this case the on/off and volume control. Although this is a nice feature, one has to wonder how much this added to the cost of construction of the receiver, and whether the cost was justified at this (the lower) end of the market. 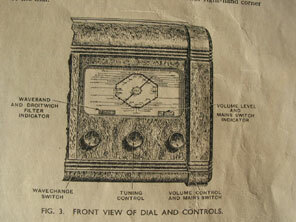 The feature would appear again in 1939, and the Touchtune 5 pictured on the next page shows a picture of the workings of the Bowden cables. 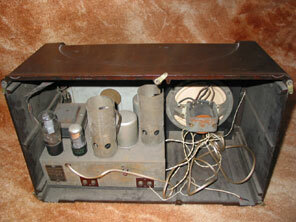 Valve line-up for this receiver was KT63, W63, W63, U50. It is a little puzzling that whilst this receiver was at the bottom of the GEC range for 1938, this radio rarely seems to turn up nowadays.